Hahei Beach with a family, sunbathers and swimmers enjoying the sunny summers day. Pohutukawa trees flowering and an azure blue sea. 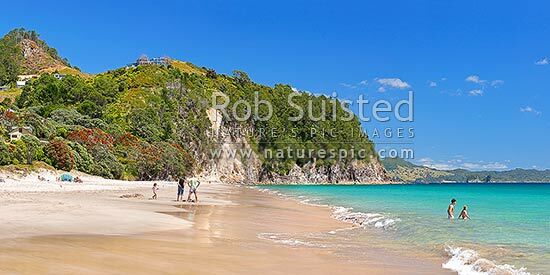 Panorama, Hahei, Coromandel Peninsula, Thames-Coromandel District, Waikato Region, New Zealand (NZ), stock photo.